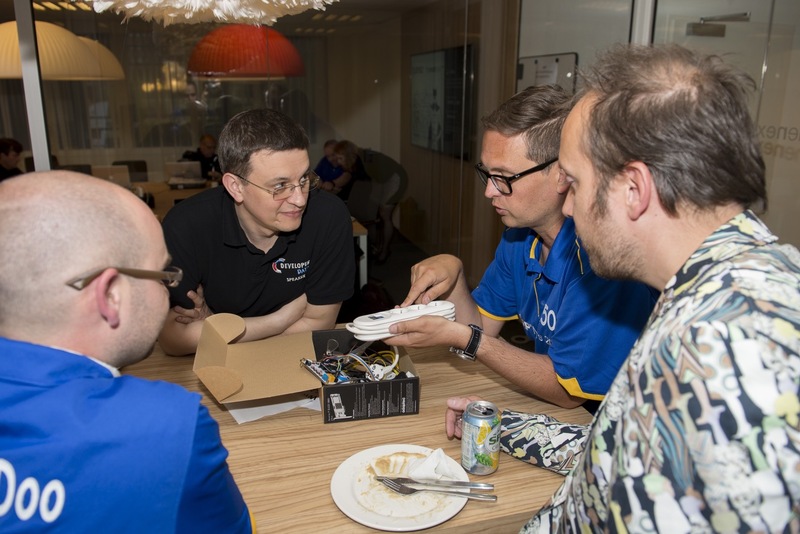 On May 29, SAP and The Next View organised a CodeJam on one of my favorite topics: The Internet of Things. SAP has brought the Node.js-based Tessel development boards to experiment with. Of course, the emphasis shouldn’t be on the hardware and soldering, but on connecting them to the SAP Hana Cloud. I must say, this Tessel is quite a nifty little board that’s extremely easy to program. On the other hand, I also felt powerless when it decided to reboot out of nothing, perhaps due to some very hot-off-the-press firmware? Thing is that it did play nice with the HANA Cloud Platform. So I took this as a challenge to push the ESP8266 into the HANA Cloud as well. Except that instead of $75 it sets you back only $3 and instead of a quite bulky board, it’s nothing larger than a €0.05 coin. More on this topic will follow hopefully soon. Because connecting the Tessel to the HANA Cloud Platform is quite easy, there was plenty of time to talk to my colleagues from the SAP ecosystem, and show the ESP8266-based powerstrip and thermometer. I hope I may have found a couple of like-minded souls that are interested in experimenting with the chip as well. The CodeJam was concluded by recording another episode of the HANA Café NL podcast. During the podcast we have discussed the SAP HANA Cloud Platform IoT services, but we also talked about the changes that the Internet of Things will bring to society. This time the podcast was mostly in English, making it suitable for an international audience. Next Post Fiori 2.0 – The future looks bright for SAP users!